If there’s one thing that tells everyone in Washington, DC that it is spring time is the blooming of the state’s famous cherry blossoms. That and the annual National Cherry Blossom Festival that lasts for three whole weeks. During this time, almost 2 million people go to Washington just to witness the flowers growing among 3,000 plus trees bloom to their finest. It happens from March 20 to April 15 and is spent with countless events that celebrate both the bonding of American and Japanese cultures brought about by the gift given by Tokyo Mayor Yukio Ozaki way back in 1912. The magical moment when people witness the cherry blossoms flourish is called the Peak Bloom. 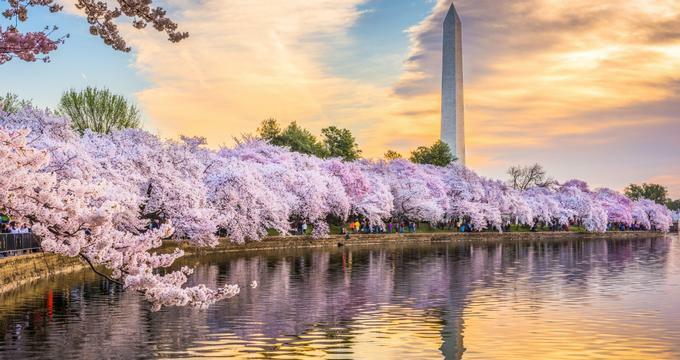 This is when approximately 70 percent of all the trees around the Tidal Basin are filled with blooming blossoms, creating a wonderland of white and pink colors. The growth of these buds is being measured by the National Park Service or NPS and they make it a point to predict when the peak bloom will happen each year. This 2018, the National Park Service predicts that the cherry blossoms will reach peak bloom on April 5. Once the peak blossom is determined, visitors can find the best time for viewing within four to seven days right after peak bloom. Under ideal conditions, however, these blossoms can stay their best for up to two weeks. More often than not, peak bloom takes place around April 4, although the actual day can change every year. In 2012, the peak bloom actually happened a lot earlier, set on March 20, and this was attributed to the strange warm weather they were having. In 2014, the bloom took a while to happen, only peaking at April 10, and this was thanks to the cold weather at the time. The blooming period will last for about 14 days before the petals of the cherry blossoms fall off. Note that the NPS states that it is almost impossible to determine the actual peak bloom within 10 days in advance. More importantly, they always advise the visitors to always do their part in protecting these beautiful flowers by never picking them. Besides, it’s against the law, and you don’t want to get arrested for picking a flower. Keep in mind that going to the Cherry Blossom Festival isn’t just about watching the flowers bloom. There’s a festival that lasts for three weeks and literally takes place everywhere in DC. Here are some of the events you definitely can’t miss! Pink Tie Party: For $225 per ticket, you get to access a fun party filled with people in gorgeous attires drinking cocktails and having good food while watching a lot of dancing and enjoying live music. Before you think that it’s too expensive, remember that this is a fundraiser as well. Make sure to catch the cherry blossom mixes that go around as well as the silent auction that happens later. Performances at Tidal Basin: It takes place between March 24 and April 28. During this time, people will head over to the Tidal Basin to not only watch the cherry blossoms bloom but to also witness live performances from all kinds of artists. Don’t worry, unlike the Pink Tie Party, this one’s free admission. The National Park Service also caters to visitors by selling them food, books, and souvenirs. Smithsonian American Art Museum Cherry Blossom Celebration: If you’ve been looking forward for some exposure to awesome Japanese culture, head over to the Kogod Courtyard and check out all the Japanese dancing, taiko drumming performances, face-painting, cherry blossom arts and crafts, and scavenger hunts. Opening Ceremony: If you really want to get a good start with your visit, you want to make it official by reserving tickets to the opening celebration of the Cherry Blossom Festival. It’s for free, so you just need to make a reservation. The opening ceremony comes complete with beautiful performances at the Warner Theater to get you pumped for the next three weeks. Blossom Kite Festival: As the name of the event suggests, this is going to be a haven for kite-flyers everywhere. Kite flyers from all backgrounds gather around the Washington Monument grounds and compete in the Hot Tricks Showdown, which is a place where experts can show off their kite-flying stunts. Don’t forget to bring your camera! Freedom Walk: Want to take stroll? This freedom walk commemorates the experiences of Japanese Americans back in World War II and reminds people of the value of their civil liberties. This 2018, the event not only sees itself in its 20th anniversary, but it also celebrated the 30th year of the Civil Liberties Act which was passed back in 1988. The walk start and end point is the Louisiana and New Jersey Avenues, where the National Japanese American Memorial is. Petalpalooza: If you want nothing but eight hours of music, and fun activities only to be capped with fireworks, then you’ll want to head over to The Wharf, one of D.C.’s latest developments along Southwest Waterfront. The fun starts at 1:00 PM and goes on until the fireworks at 8:30 PM. Japanese Culture Day: It’s not all about parties. There’s also a place where you can learn more about the culture of the Japanese. Head over to the Thomas Jefferson Building at the Library of Congress to get a free access to hands-on activities like origami, learning how to wear a kimono, and a closer look at Japanese cuisine. Sakura Matsuri: Finally, don’t miss out on the biggest Japanese festival that lasts for one day. It’s an event for all ages and features art, food, goods, and other activities from 80 cultural groups, all wrapped in almost 30 hours of programming. You can find this on Pennsylvania Avenue between 3rd and 7th Streets. Unless you’re really planning to stay a very long time in Washington, there’s a chance that you won’t be able to visit all the events mentioned above in one visit. But hey, at least now you know most of the good stuff, so you can make the most of your first visit. Don’t forget to take a photo of the cherry blossoms!